New Zealand and Japan are talking about setting up a group to support development in the Pacific. The Prime Minister, Foreign Affairs Minister, Defence Minister and Trade Minster all met with Japan’s Foreign Minister, Taro Kono, in Wellington on Monday to talk about the two countries’ “strategic partnership”. 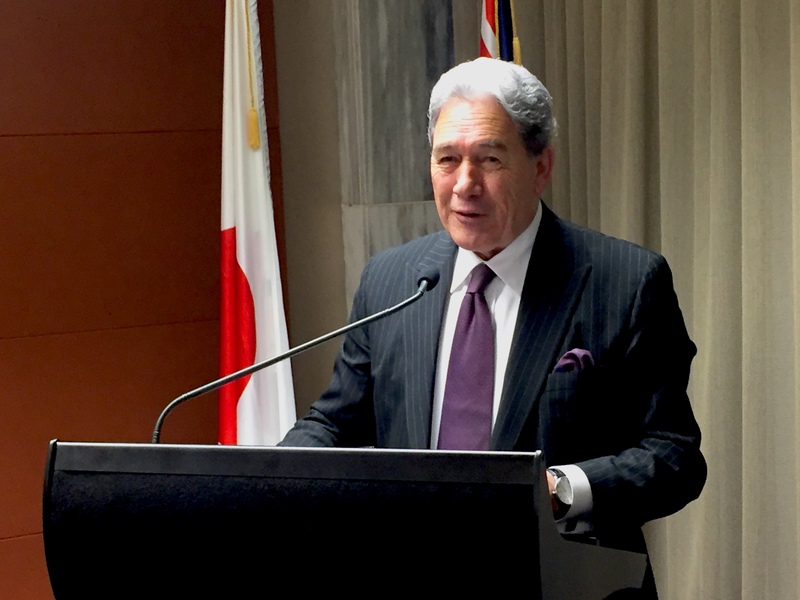 Speaking to media, Foreign Affairs Minister Winston Peters highlighted the need to set up some sort of a body that could take action in the Pacific, without being weighed down by bureaucracy. While infrastructure development and security were a focus, both Peters and Kono singled out Pacific nations’ high levels of indebtedness, particularly to China, as concerning. The other countries he mentioned through the press conference were Australia, the UK, the US, France and the European Union more generally. On the debt issue, he said it was important countries didn’t take on debt they couldn’t service. However he didn’t go so far as to saying whether New Zealand or Japan would help Pacific nations repay their debt. She underlined New Zealand’s aim to work in partnership with Pacific nations on issues they’ve identified, like climate adaptation. The new Comprehensive and Progressive Agreement for Trans-Pacific Partnership (CPTPP), which both New Zealand and Japan are a part of, was also a topic of discussion between the leaders. Kono said he’d welcome China entering the trade deal provided it met its high standards. Asked whether he believed this would be possible, he said: “It’s not for me to answer… It’s for them to demonstrate if they can. Peters denied his discussions with Kono illustrated a “meeting of minds” between New Zealand and Japan on the role of China in the East Asian and Pacific regions. Something tells me China wouldn't be too keen on joining an international partnership aimed at protecting intellectual property over all else. The may join, but whether they'll abide by such an agreement is another matter. The current membership is pretty good, all medium to smaller nations, with Japan being the only major regional power, we should keep it that way. Adding Britain would be good, but only if they gain their independence from the EUSSR. Much better to politely find ways to keep the big bullying players out, so no to USA, China, Russia or the EU. Either that or follow the Commonwealth model and suspend members who fail the standards of decency and democracy. My sense is that size matters and that the group will only function if no one member is too powerful. What the politicians say in public is a different matter, as in diplomacy one may allude to an issue but generally best to be cautious in the choice of words. Send the Pacific leaders to Xinjiang and Tibet, they might get to see their future in time to avert it. There is rarely altruism when it comes to international relationships. NZ/AUS's relationship with Pacific nations has always been a master and servant relationship down to its core. The pacific nations have some strategic purposes for NZ/AUS in many areas - security-wise as a buffer from any wars down in south pacific area, economic-wise as a (seasonal) labour supplier, holiday destination and exports markets, and international relationship-wise as a beacon to demonstrate NZ/AUS's global reputation by showing their generosity on both financial and humanitarian aids. The 'concerning of indebtedness' is simply a sugar-coated excuse to keep the master-servant relationship and therefore those strategic purposes by undermining Pacific nations relationship with China. I am not saying who is right or wrong. I am asking the question what is the best interest for NZ. Can't help but agree. this debate is about who the master is. Unfortunately I don't believe NZ or Australia were ever in a position to actually assist these nations in building their own economies in any really meaningful way. And I suggest that China will not want to either, as corruption is too evident, and will dig in deeper if they try. For these nations, it becomes a choice though. Who do they chose for their master? Aussie and NZ will likely share an aligned status and are at least democracies that at least superficially serve their people, but if China's political aspirations in the pacific basin work to undermine to local power and authorities of these nations peoples, then what ever choice they have made may come back to haunt them. The US will naturally be very interested. NZ is too small to help/aid/influence all of the pacific. I think we have an historical obligation to concentrate our long term efforts on just Polynesia. i.e. Samoa, Tonga, Niue, Cooks, Tokelau. With a total population of less than 0.5M we can help. The Melanesian and further afield states have never been and are not our responsibility. If you change the 'always' in your second sentence to 'usually' then you have my agreement. NZ's reputation in PNG and the Solomons is good - maybe better than it deserves but that is because the comparison is Australia. NZ has performed altruistic acts for example with peace keepers in Melanesian countries. We should keep trying to be good neighbours - in the long run it is to our advantage but you need to think political long run in the way China does - maybe many generations. I am sure a neighbour that is controlled by China is in no way in best interest of NZ. I may agree with all you say about relationship between NZ/AUS and pacific countries. Or in the bigger context the imperialism (that was the word i guess 50 years ago) of western countries. However, I also believe that tyrannical regimes, including CCP, are worse in any department. They are not even accountable to the people they supposedly need to serve. Let alone "slave nations" as you have phrased it. This is where it all gets a bit complicated. Every country mentioned in the story has an interest in what we know as the South China Sea and indeed those other island nations below that, including Indonesia. From our perspective Darwin is a key spot on the map and one we should be supporting, even from NZ. I like the Japanese involvement. I think they've got a very important role to play in how all this pans out. Yes, they're a bit under-armed currently, as a result of the situation 75 years ago, but I see that changing. It will be a very interesting 'discussion' I'm sure. In this particular situation, we don't have a safer pair of hands than The Hon W Peters to represent us - and I don't say that a lot.